While on a walk, "Mew Mew" found a mysterious flower in the yard. These are not dandelions. This is coltsfoot, Tussilago farfara. 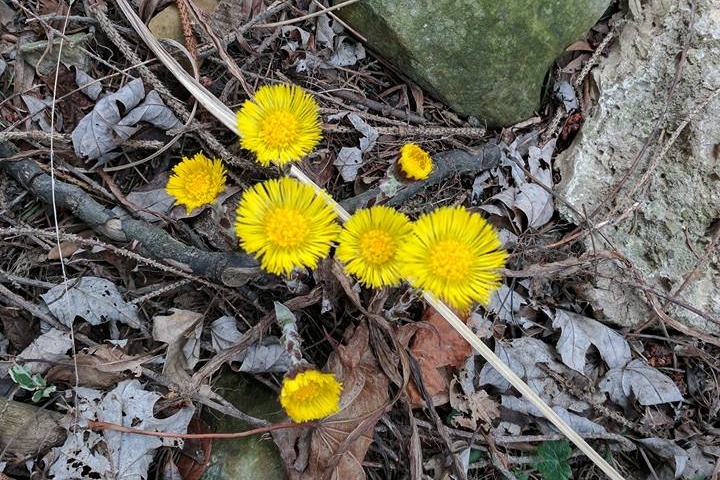 Coltsfoot is a herbaceous perennial. Flowers emerge first, before the foliage. The bright yellow flowers have both disk florets (center) and ray florets around the edge. This gives the flower a slightly bowl shape. Stems are covered with scaly bracts, which give emerging flower stalks an asparagus-like appearance, and white wooly hairs. The flowers will bloom and go to seed before a basal rosette of heart-shaped, slightly serrated leaves emerge. Again like the dandelion, it will get a white fluffy seed head but more compact and smaller than the globe of dandelion fluffs. The seeds of coltsfoot will germinate in spring and summer after they are shed, developing roots and leaves by fall. Flower buds will form throughout winter on the rhizome root to come up next spring. It is a non-native plant to North America, thought to be intentionally introduced by settlers in the 1800's for its claimed medicinal properties. It is commonly found along stream banks and near other bodies of water, disturbed areas, or generally moist, clay soils. It's considered flood-tolerant and salt-tolerant making it a fairly hearty little flower. It spreads by seed and rhizome and can invade disturbed areas. The photos above were an area behind a garage where top soil and mulch had historically been piled, that may have had seeds or root material therein.